With the start of the academic year in both secondary and tertiary institutions along with everyone having settled back into work, March has traditionally been the time of the year when Public Transport is strained the most, as is often talked about within the blog. This article talks about one aspect of this in the context of Sydney, more specifically the locally infamous route 891. A small note, the photos at central were taken on 28 Feb 2018, between 0745 and 0835, so it almost March, but not quite. 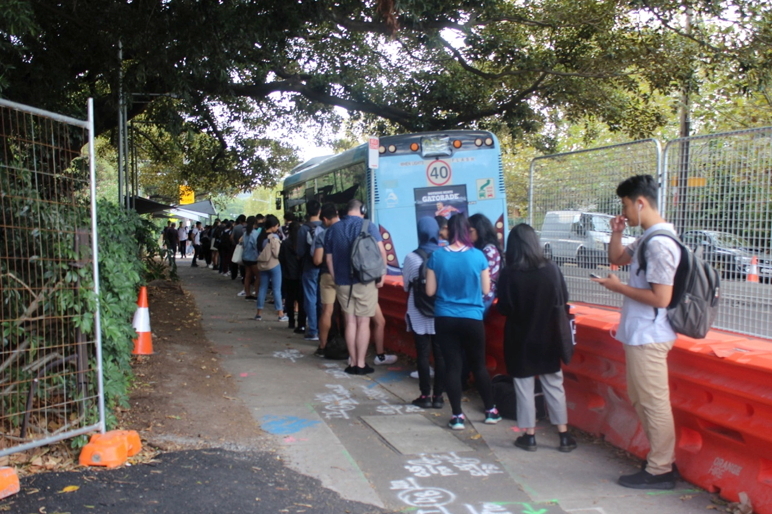 Essentially it is a bus route that connects Central Station and University of New South Wales (UNSW) based at Randwick. The route itself is 5.2 km long, with no stops, roughly equivalent of Albany to Sunnynook on the Northern Busway, which is kind of fitting as part of this route operates on a busway (next to Moore Park) and some of it is in general traffic. The points I’d like to make are that the tape that runs from the bus shelter on the left to the one on the right. This is used to corral people who want to catch the bus. There are 6 marshals who are wearing fluoro jackets and appear in most photos near the end of the queue on the left or assisting with the all door loading of the buses. Noting that there are other bus stops operating from the same strip of road, so the queue I’m talking about goes behind the bus shelters. The bus on the extreme left is articulated (a bendy bus) and as is the one I can’t locate in this shot, but they both loaded at the same time. 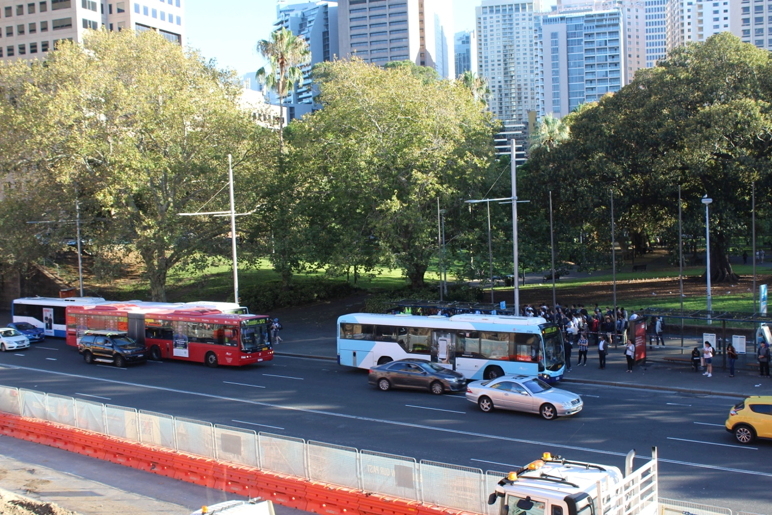 Where the two buses on the left are on route 891, and the two buses on the right are running on normal routes (372 & 374) both going to Coogee, which incidentally go past the UNSW campus. Although it doesn’t show it, the bus loading at the front is stopping the articulated one entering the stop, which in turn is delaying the two 891 services from leaving. This is one of the reasons that the City to South East Light Rail project (L2), which part of the construction can be seen in the foreground on this photo. This was in 50 minutes and relatively early, although it is the beginning of the trimester, so you’d expect that there would still be some keen students around. The other point to note is that the buses are full, with lots of people standing. So if all of the students go, how do they get back? They have two routes the 893 and 898 that do this, mainly because the UNSW campus is big, (it is approximately 1 km down the side of the campus), so dropping off in two places is ok, but if you only had one start point, the bus would be full before it got to the second stop, so a little useless for some. The queue continues down the hill to the orange/yellow sign, so is about 5 times longer than the bus. This photo was taken at 1.30 pm, so hardly peak time. 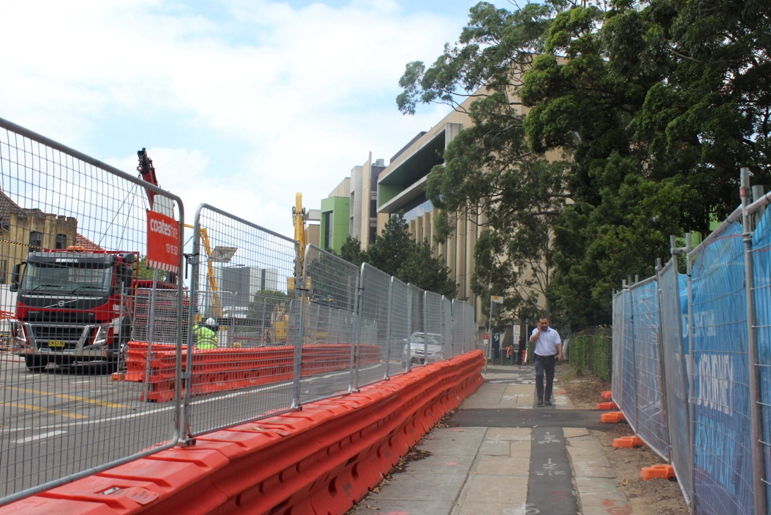 This last photo shows part of the UNSW campus on the right and the construction of some of the L2 Light Rail on the left. The large building in the centre is either part of the Childrens Hospital Randwick or Prince of Wales Hospital, which is near the termination of that branch of L2. 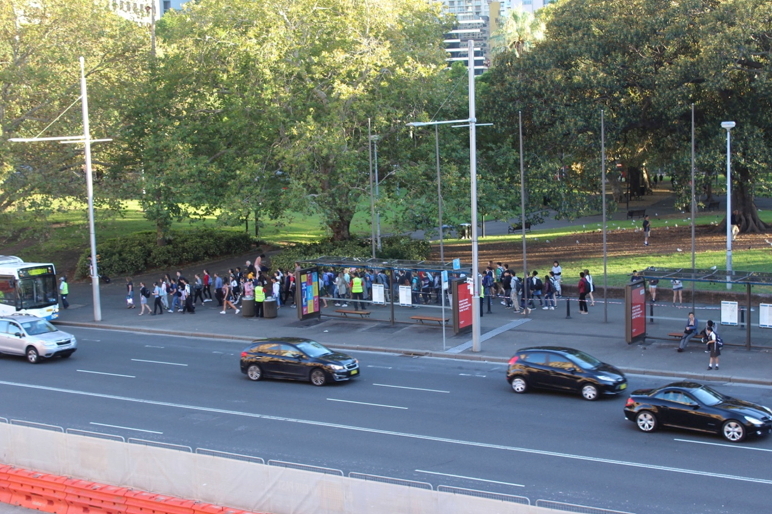 The full 891 queue in the morning peak can street right across Belmore park. I was inspired to write this when I saw the queue going around the corner last year. The queue can be unbelievably long. The 891 is one major reason for the C&SELR as it contributes a fair counterflow traffic to the area and is well patronised for much of the day. there are about 38,000 students at al of The UNSW campuses, plus the main campus is adjoined by a huge teaching hospital complex, three public and one private, that is itself a huge traffic generator and surrounded by private practices and day clinics. Also adjacent to the tram route are the two biggest State selective schools – Sydney Boys and Girls high schools, where pupils come from all over the metro area, many by train. These generate another 40-50 dedicated bus services in teh morning and evening. Another comment – Route 891 is a no cash Fare route. I have just checked the current Tt from 0745 to 0835 and found 33 services, so the observation was pretty correct. Mmm … 33 services in almost an hour. How many was it in the full hour? 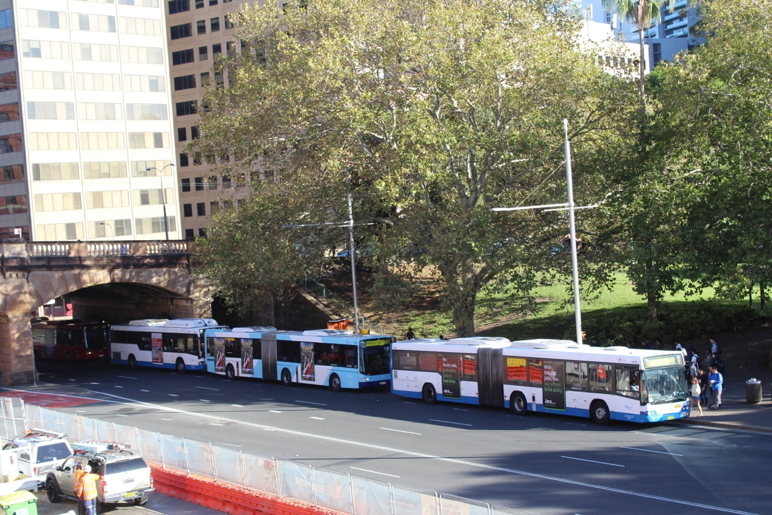 How many was 18m bendy buses, how many the usual 12m ones? 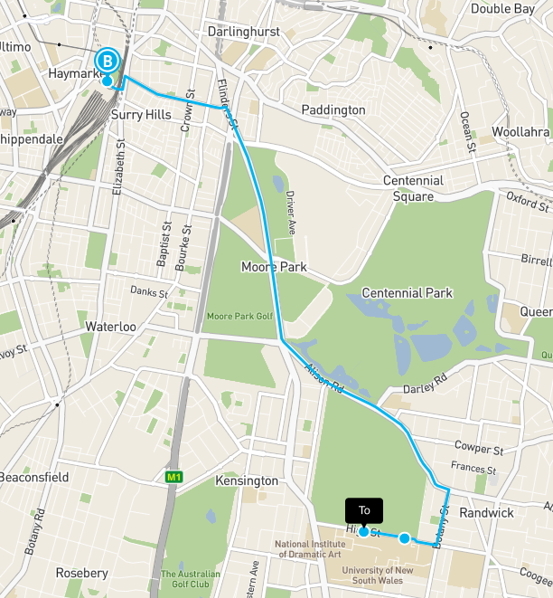 I’m curious of the PPHPD achieved for that peak hour for this 891 route. There were Marshalls at the UNSW end when I came back, but i’m not certain how much of the day they’re at each for. There’s usually at least one marshall whenever the buses are running during semester (they also run outside semester, but on a less-frequent timetable). They probably answer questions, but most of the time they’d be too busy. 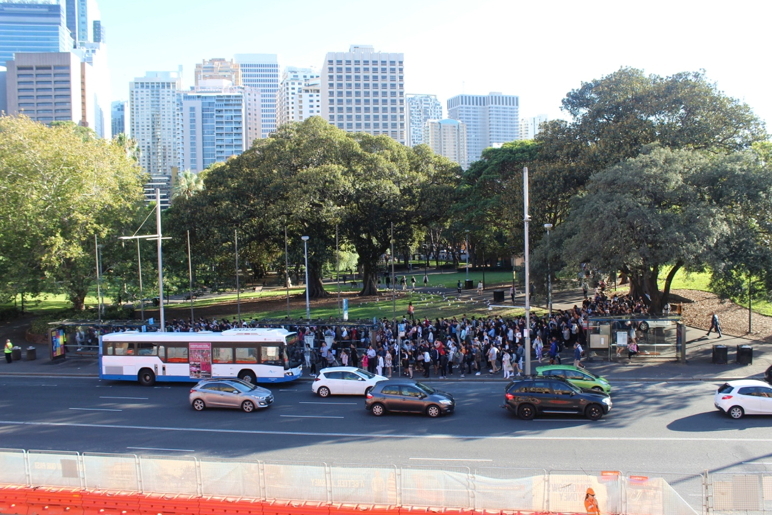 Queuing for buses is quite common in Sydney, and the 89X queues are annoying but relatively fast, given their length. There are more buses this year – it was worse last year at times. Apparently the light rail will be at full capacity (or worse) as soon as it opens https://www.smh.com.au/national/nsw/sydney-cbd-and-south-east-light-rail-crowding-rates-exceed-bus-and-train-crush-capacity-20170220-gugtx9.html. Connectivity to the west of the campus is also extremely poor – especially considering the massive increase in population of the Green Square urban renewal area here. I’ve walked 40 minutes to the nearest train station, rather than wait 40 minutes in a queue for a bus. At least the 89X queues move relatively quickly. The large building in the final photo is still part of UNSW, by the way – the hospital precinct starts on the next block. Thanks. What solutions do you see to the connectivity issues? Long term, I think there needs to be a rapid transit connection to the west, preferably heavy rail (which would need to be underground) or even light rail. The 89X buses run from Central Station to UNSW, so anyone who’s not within a local bussing distance will get a train to Central, then an 89X. Connectivity to another station could give people more choice and lower the number of people who have to use the 89X. The City of Sydney council has been fighting for light rail in the Green Square precinct for a number of years, but the state government has not been interested particularly. The plans I’ve seen for Green Square light rail also miss UNSW by a kilometre or more – UNSW is in the neighbouring local government area to City of Sydney, so the light rail plans don’t extend there (and of course, there’s already a huge light rail project to UNSW). More bike paths would also improve things. Currently you can cycle from Green Square, but once you get outside City of Sydney, much of it is on busy roads. Sorry, correction: there are more than 2 routes to the west from different bus stops, but in any case more services are needed.